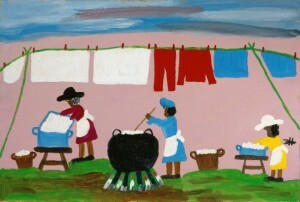 First impression of Clementine Hunter’s paintings: charming, quaint, life on the plantation. But, look deeper into these child-like paintings of picking cotton, picking pecans, washing clothes, baptisms and funerals. Even though she was born in 1886, twenty years after the Civil War, segregation and oppression of the blacks was still rampant. These paintings are gentle images of this oppression. What a story! Clementine spent much of her life working on a plantation in Louisiana and only attended school for ten days, never learning to read or write. While she was working as a house servant, an artist visiting the plantation left some discarded brushes and tubes of paint. She became intrigued and used the brushes to “mark a picture, or a window shade.” Clementine Hunter’s career as an artist began. Often referred to as the black Grandma Moses, Northwestern State University of Louisiana granted her an honorary Doctor of Fine Arts degree when she was 100 years old. Henry Darger’s story is heartbreaking but he left the world a treasure trove of art. Tragedy found Henry Darger early and often. When he was 4 yrs old, his mother died. Unable to care for him, Darger’s father placed him in an orphanage. Labeled a troublemaker, the young Darger was moved from institution to institution. At 16, Darger ran away and for the next 64 years he lived alone in a rented room and worked as a janitor in Chicago. Darger died at 81. His landlords cleaned out his room and made a startling discovery: alone in his room, Darger had created hundreds of beautiful, large paintings illustrating an epic fairytale (15,000 pages) he had written over 60 years. Crayon and ballpoint pen on paper. 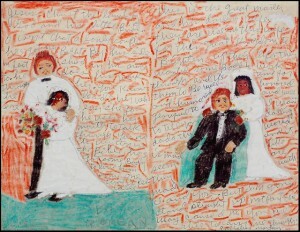 Sister Gertrude Morgan (1900–1980) was a poet, a preacher, an artist, and a singer who loved Jesus. She called Jesus her husband, her doctor, and her airplane (yes, airplane), and claimed to have met with him in visions throughout her mid and later life. Born on a farm in Alabama, in 1900, Sister Gertrude left school after third grade so that she could help her family with the farm work. Preaching the gospel tirelessly in the streets of New Orleans, Sister Gertrude founded an orphanage and ministered to the sick and inmates of Orleans Parish Prison for years. Later in life, she said she had had a revelation that she was to be the “little bride of Christ.” This calling she took with great seriousness, dressing solely in white garments for the rest of her life. After this revelation, Sister Gertrude’s paintings were little figures of herself in a white bridal gown standing beside a pudgy little Jesus wearing a tuxedo. Other images pictured her and Jesus in an airplane flying around heaven. She was adamant that her paintings were divinely inspired and indeed, perhaps they were. “Jesus is My Airplane,” sold to a private collector for $20,700. Watch Sister Gertrude Morgan in New Orleans. 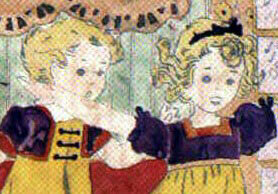 Fantastical video of Henry Darger’s images and fairytale. As a somewhat pious art friend once said: “Nobody doesn’t like Folk Art”, and as the caterer for the recently closed American Folk Art Museum in NYC, it would seem not so. Slowly over the years it has crept under my skin, and no artist so effectively as Darger. What a story, what a character, and what a life’s work. It is just splendid.. and thanks, Sis, for reminding us! Enjoyable and informative, Kirby. Delighted that Hunter received an honorary degree, Doctor of Fine Arts. Obviously earned and well deserved. Apparently had to reach the age of 100 before properly appreciated. Well, I guess, in part, that means it’s never to late for the rest of us guys/gals. Kirby, what a grand way to start my day – taking time to explore your newest blog. I look forward to each blog. Your creativity is spilling out of each blog. This research must take a lot of time. Thank you for investing it so we can all benefit from your findings. Bravo Kirby!!! Have always loved outsider art as these artists convey their take on the world without being influenced by other people’s teachings. Henry Darger images have been a favorite of mine since I first experienced them. I read that for his army of little girls he often traced from coloring books of the 1940’s. I did a lot of coloring as a little girl. His little girls must seem like old friends even though he put them up to some very naughty things! Hi Kirby. I particularly enjoyed this blog topic. Several years ago a friend intoduced me to Outsider Art. She saw a painting that Jerry inherited from his mother, who bought it from a patient she worked with fifty years ago at a “mental hospital.” My friend told me how this so-called underground movement as evolved and blossomed over the years. Recently I attended an art exhibit sponsored by Goodwill Industries. The artists all were people with mental or physical disabilities. I loved their creations which definitely can be described as Outsider Art. The teacher/curator said the process of self-expression is such a benefit for these artists. These profiles are moving, inspiring. Let’s. Discover and promote the artists when they r still with us! Thank u! The human spirit always amazes me, as do these artists. Thank You for bringing to the fore once again the accomplishments and bravery of the human spirit.